Danai Gurira is leaving The Walking Dead next season. 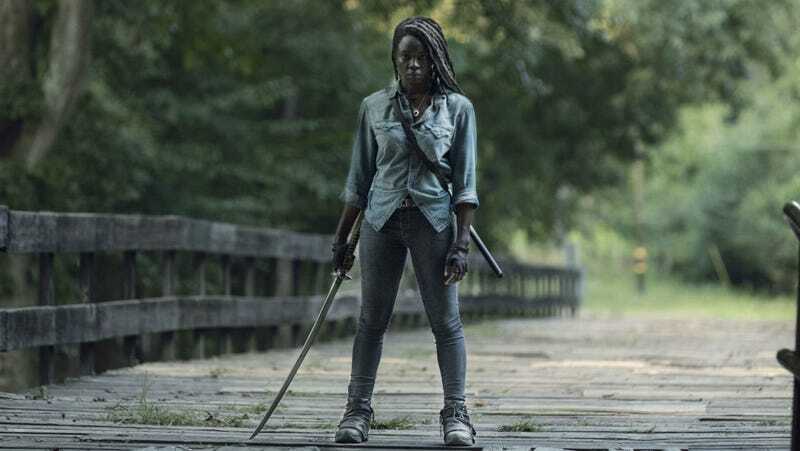 The Hollywood Reporter just broke the news that Danai Gurira, who plays the badass, samurai sword-wielding Michonne on AMC’s The Walking Dead, has signed a deal to end her run on the show. She’ll appear in the current season, which comes back for its second half Sunday night, and then only appear in a limited capacity for season 10, which starts in October. According to the report, part of the deal includes her appearing in one or more of the three Rick Grimes movies AMC is planning, spinning off from the show. In recent seasons, Rick and Michonne were romantically involved and surrogate parents to Judith but we’re still not sure where those projects will lead. Two characters that won’t be leaving anytime soon are Darryl (Norman Reedus) and Carol (Melissa McBride), who both reportedly signed massive “franchise/universe” deals for the series. Meaning, they can appear in other shows, movies, or whatever AMC and the team have cooked up. And they certainly will have a lot cooked up. Losing first Rick, and now Michonne, are huge blows to the show. Maggie is also said to be out of the story for now (probably due to her ABC series commitments), but Lauren Cohen could return in a spinoff project as well. Fans can rest assured though that Michonne will at least be around through this year. The Walking Dead, with Michonne, returns for the back half of its ninth season Sunday, taking on the Whisperers. On the big screen, Gurira—a standout as Okoye in Black Panther and Avengers: Infinity War—will next be seen in Avengers: Endgame in April.